Published on July 24, 2008 in Beer Culture and Other Beers. 1 Comment Tags: 2008, OBF, Oregon Brewers Festival. I requested to have Thursday off back in May. Opening day of the Oregon Brewers Festival? What better way to beat the crowds and try the beers I want with no lines? I met Alan and Kathleen shortly after 2pm, and we sampled a number of beers before the rest of the world reached the end of their working day. I can’t speak for their preferences, but here are the few I tried that I’d recommend to other festival goers. Rock Bottom Congo Queen: another Sorghum beer, but this one takes the delicate flavor of sorghum and uses that flavor void to highlight the yeast and a number of spices. Really quite nice, though maybe not what my celiac grandfather has been looking for. Bridgeport Hop Czar: A robust imperial style IPA. Lots of malt and lots of hop. Would be better in about 3 months. Boundary Bay Crystal Pale Ale: A single hopped beer using crystal hops. This beer is subtle, delicate, and delicious. I love crystal hops though, so the slightly spicy noble hop creates a nice head-to-toe beer. Probably one that non-hop heads would enjoy too. Lagunitas Hop Stoopid: All sorts of good. Great body, great flavors, and great sweet to bitter shotgun of hop flavors. I’ve not had this for a year, but it’s really fantastic. I’ll be heading back with friends on Saturday too, but I feel like I got a good head start. 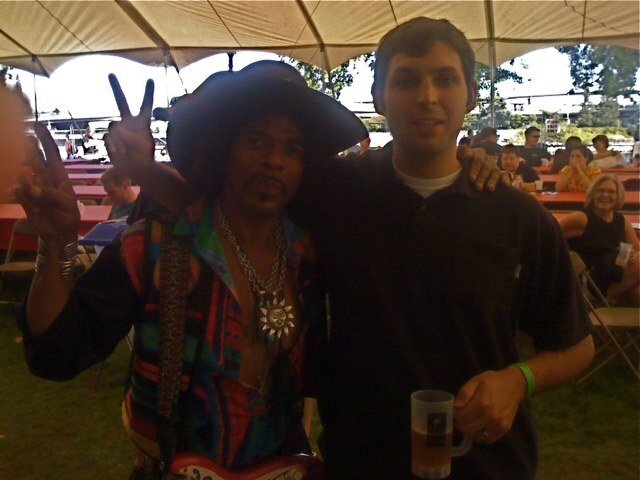 The atmosphere was nice, the weather great, and I got to meet Jimi Hendrix and the owner of Boundary Bay Brewery in Bellingham. Not the real Jimi, of course, but the real owner of Boundary Bay. I sent a picture of myself with him to a friend in Bellingham to show off. 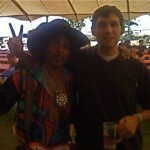 edit: Jimi and I at OBF.